THURSDAY, 24th November 2016: As nations across the globe move towards an ageing population, it is becoming more imperative for the aged care industry to innovate itself in order to better cope with increasing demands and changing needs. In Singapore, Innovating Care Asia Pacific hosted the Elderly & Home Care 2016 forum, providing a platform for decision makers, practitioners, researchers, service providers, and community members to share their experiences to support and empower rapidly ageing populations worldwide. Amongst speakers from various organisations, which included Eldercare Singapore, HoviCare Finland, ACCESS Health international and many others, CEO of Aged Care Group, Carol Yip gave the audience insight into Malaysia’s ageing climate. 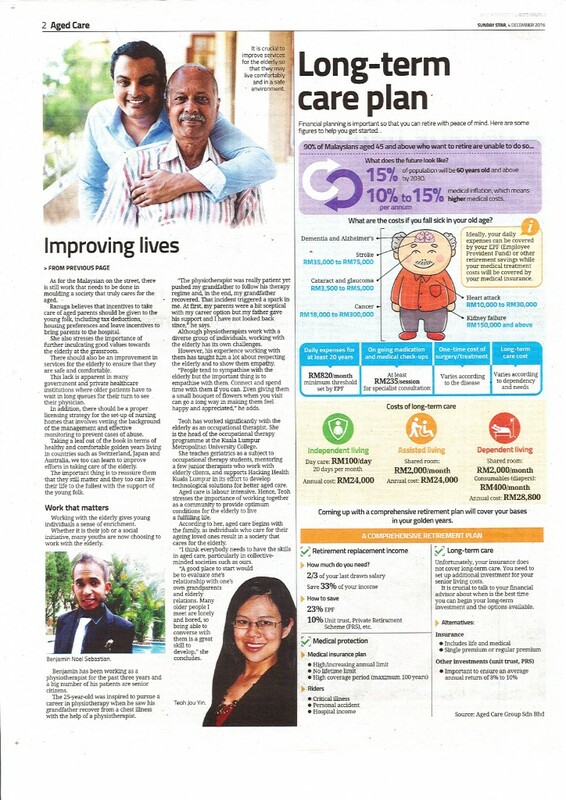 In her presentation – titled “Malaysian Insurance and How CareTRUST™ – A Living Trust Provides Financial Stability Towards Your Aged Care” – Carol spoke on Malaysia’s need to identifying sustainable mechanisms to providing financial safeguards for it’s ageing population, the challenges facing Malaysia and how the CareTRUST™ – launched in Malaysia in February 2016 – will help Malaysia cope with the demands of its’ growing ageing population. SENIOR age care projects should not cater only to the rich but also to middle-class groups. It must also not focus only on the architecture of the building but also on the accessibility to public facilities such as public transportation and conducive walkways. These ideas and suggestions were among others discussed at the After Hours Intelligent Conversations, a networking session hosted by Woods Bagot, a global architectural and consulting practice together with the Aged Care Group (ACG). The discussion was participated by Health Ministry’s Family Health Development Division director Dr Safurah Jaafar, Performance Management and Delivery Unit NKEA healthcare, NKRA Low Income Household director Fabian Bigar and Woods Bagot’s Development in South-East Asia director Matthew Gaal and Health & Science Sector specialist Nikki Beckman. About 60 industry experts took part in the discussion. Those from different disciplines exchanged ideas, experiences, and knowledge, while they developed new ideas about design and architecture of Malaysia’s townships that would promote multi-generational living with purpose-built aged care facilities. Bigar said developers and senior age care providers should overcome the perception that such projects were for the rich. He added that it was not easy to convince people that senior age care was something important. “Developers and those in the aged care business need to help people overcome the perception that this is only for the rich. “You need to develop projects for people from all walks of life and make it affordable for the middle income and the less fortunate,” said Bigar. Dr Safurah said the elderly should consider negotiating with their children on liquidating their houses for their old age care. The middle-income urban community should consider liquidating their houses for their old age and start planning for their retirement when they are younger, she said. “Our community commonly pass on their properties and everything to their children. We must plan for our senior age care,” she said. She highlighted that seniors living in the villages had good neighbourhood support, hence they were better cared for. However, those from the middle-income bracket living in urban areas would need to start planning early for their senior years. Dr Safurah said old age should not be stereotyped and pictured as a depressing stage in life. Instead, the public should emulate a healthy lifestyle and picture themselves staying active even through their eighties. “Emulate a healthy lifestyle, such as cooking, going for walks and on holidays, instead of lying in bed all the time,’ she said, adding that they should also think positive. On setting up senior age care projects, Dr Safurah said developers had many model communities to refer to abroad and locally. She emphasised that developers and operators should plan according to the new Private Aged Healthcare Facility Act to ensure the provision of long term care is of quality and affordable. “In long-term care, people just need friendly features and not necessarily sophisticated equipment,” she added. Beckman believed that topic of the caring for the aged suffered because it was not appealing to talk about. 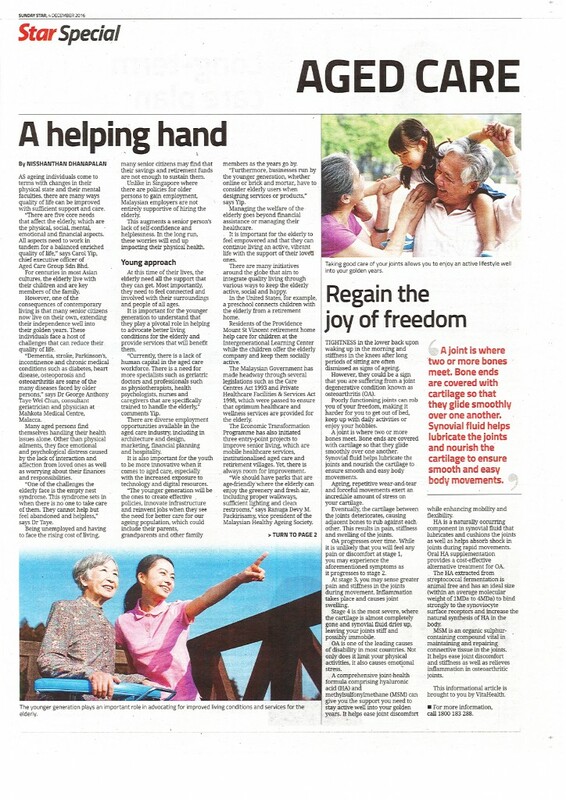 “The perception of ageing and the value we place on our aged population needs to change,” she said.